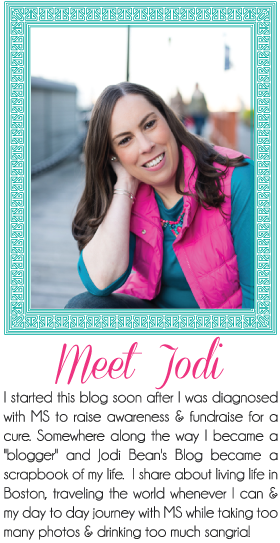 Jodi Bean's Blog: Life Lately. . .
A rare Saturday blog post while I have access to my friend's laptop. It is a MacBook and the keyboard is set up a bit different from my PC so I'm feeling like I forgot how to type and making many typos. Bare with me while I try to update you about life lately! My laptop is being repaired. It is only about 7 months old but decided it didn't want to charge anymore. Unfortunately it wasn't an issue with the cord but the actual charging unit in the laptop. Also unfortunate was that the warranty does not cover that part. So I'm stuck paying to have it fixed. Ugh! My IT guy at work has one of his IT friends fixing it for me but it is taking forever for the part to come in. I've already been w/o it for over a week. Right now looking like I may get it Tues. FINGERS CROSSED!!! It is so hard to live w/o my laptop b/c I can't blog! I'm dogsitting/housesitting this weekend. The good things about this are that I can use their laptop, I can do my laundry for free and I get paid. Oh and I get to hang out w/ this cutie (aka the most spoiled, silly dog I know, Lucy). My iPhone is still in a snow bank in my drive way. It is 50 degrees today and I am PRAYING for a lot of melting. I am literally a mess w/o my iPhone 5. I am using my old iPhone which is a 4 and it is terrible. It is SO slow it drives me crazy. I'm glad I at least have something to use but my oh my is it testing my patience. I need to find my other phone. I'll likely be outside digging through the snow tomorrow. . . Speaking of snow, since the storm the claimed my iPhone there have been about 53 3 more! Seriously it snows about every other day. I can't even deal w/ one more storm this year. It needs to be snow free. Even when it kinda looks pretty is doesn't look pretty if you know what I mean. I am just so sick of looking at it. So thankful for this warmer weekend and melting!!!! I went to the Capital Grille the other night for the first time ever. It was a CEU dinner sponsored by a pharmaceutical company. I went w/ coworkers and it was SO good. I was still so full the entire next day. I ate way too much food but couldn't resist b/c everything was delicious. I don't eat steak so I was their cheap date. The chicken was so good. Way better than the chicken I had at Del Frisco's when I went there. Oh and the "Stoli Doli" which is one of my favorite drinks was delicious. I asked if I could just have a straw for the container below but they would only serve me some in a glass! I need to blog about Ella's 5th birthday party. The photos are all on my camera and just don't feel like uploading them to a temp laptop then having to do it all over again when I get mine back so you have to wait a big longer. (I know you are all dying to see her party pics w/ the one and only Sleeping Beauty)!!! I also need to blog about the Boston Wine Expo and Rachel's last night in Boston. So stay tuned for all that fun. Oh and pray my laptop is done on Tues and that I find my iPhone. Thanks!!! Is all that snow typical? It seems so excessive. Haha! I'm sorry about your phone and now laptop. Boo! I've never had a Stoli Doli, but I make my own vodka and pineapple juice drinks all the time. I think I need to try one! I am so over the snow but glad a lot of it melted this weekend. Hope you find your phone. The Stoli Doli is so good!!! Hope your laptop is ready on Tuesday. I agree with you on being sick of snow. I was doing great with outdoor runs on Monday nights, until the last 2 storms. I hope the warm temps this weekend lead to you finding your phone! Also, thanks for sharing the adorable dog photo! It made my day. I hope your laptop comes back soon! Your phone too. Is it in a lifeproof case?